compartment of your car, your purse or backpack. 2. Small pair of scissors or pocketknife. 3. Fine point Sharpie (or similar pen) to write. 5. Napkins, you probably have tons of them from visits to the drive-thru. Half-sheets of newsprint work just fine. across a bunch of seeds you'd like to save and start in your garden. where the ink "bleeds" out without the need to apply pressure. your notepad. What color was the flower? How tall was the flower stalk? recollections of a new seed saver on a gardening message board. 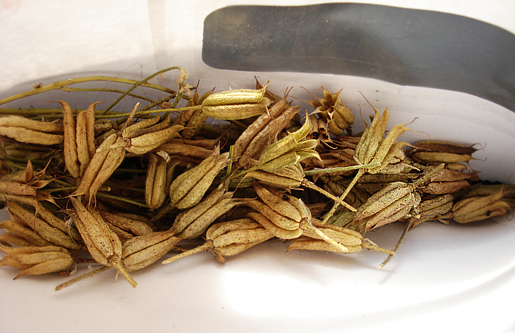 seeds, can you tell me the name of it? I think the flowers were yellow. and I miss her. :-( Signed, NewGreenThumbGirl85"
Processing Your Seeds at Home. near the window to dry for a period of a few days to a couple of weeks. following is just what I think. Your mileage will vary. Private gardens: Yes, if you ask first. What do the Seeds Look Like? Depending on the plant the seeds can be easy to spot or they can be a pain. Composite flowers like the Rudbekia pictured here are a bit of a pain. They are actually lots of tiny flowers clustered together to form one "flower." 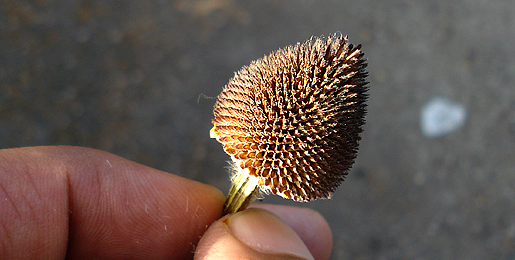 When the flower petals fall they leave behind these cones and there is usually one seed inside each chamber. You can tap the cone into the palm of your hand and seeds may fall out. I like to just collect the whole cone and dry it, then break it apart by crushing it in my palm and scattering the whole thing in the garden. It isn't worth my time to sit there and remove all those seeds from the chaff. On the other hand you'll have some flowers like the daylily with a single pod than when ripe will split open revealing several larger-sized seeds, which are easy to identify. I'll probably do a separate post on storing the seeds. Stay tuned. I wonder what Lurie's "official policy" on seed collecting is. It's not like they do it themselves (they cut back and discard)... 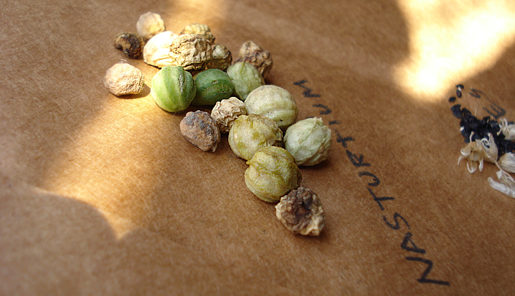 I have taken seeds out of public gardens and parks; just not out of protected areas, obviously, or when told that seed collecting was prohibited. Also, MBT, I host a snail-mail round-robin seed swap in January, let me know if you want to participate. It's open to everyone, not just bloggers... I hosted two rounds last year and will mention it on my blog soon (so people collect and save seeds). Thanks for the info Garden Faerie. I'll keep my eye on your blog for notice, I may want to participate this year. I've recently gotten back into starting plants from seeds, haven't done that in years. It's a combination of the economy, the variety of plants available, the fun of starting plants from seeds, and the fact that this garden is so darned big in previous years I didn't have the patience to wait for seedlings to get big enough to make an impact here. With all the shade and maple roots, it takes a long time for seedlings to get established. Growing them in pots for a while in a sunnier spot until they're more substantially-sized has helped a lot. This year I started all my veggies and herbs from seed, (some of it saved,) and quite a few perennials and annuals from saved or free seeds. The whole process of saving, storing, and growing from seed is time-consuming but it's free, it's rewarding, and it's so worth the effort. Most of my summer-sown seedlings are in the garden now - still have some Baptisia australis babies from seeds from a friend's garden. They were started late and are pretty small. I'm wondering whether to try overwintering them indoors or plant them out later this month and hope for the best. I agree with you about is being rewarding. Even more so than the money saving, I appreciate that I can point to something and say I grew it from a seed. It is too bad it takes perennials a while to bloom though, because like you I was impatient when I started. Don't have experience with the Baptisia so I can't say. Although, one year I was faced with a similar dilemma with Hollyhocks and I wish I would have left them out and hoped for the best. Funny you should mention that. I was just looking for my shop lights that I used to use for this purpose the other day. I'll make a note of it and put something up when we get closer to seed starting time. I am saving my collected poppy seeds for fall broadcast and spring broadcast...and then I'll cross my fingers till summer 0f'10! I just started seed saving last year, with mixed success. Got fennel hybridized with dill, for one, but did manage to grow some great heirloom tomatoes from seed that I saved. (Tomato seed saving is an art in itself.) I also had my cleome come up this year in 4 different colors (very strange, since it's all reseeded from whatever came up last year and that hasn't happened before) so I've been collecting seeds from each variety to see if they breed true next year (and thanks to MBT for cleome seed-saving tips!) I do swaps too-- check out my "swap list" over at MyFolia.com, where I'm "nax"